Anyone who’s part of the FGCU community can enter the #FGCUat20 Photo Spot Instagram Contest by posting photos of one of the 11 #FGCUat2o Photo Spots on Campus. Map for Photo Spot locations can be viewed or printed at the bottom of the page. 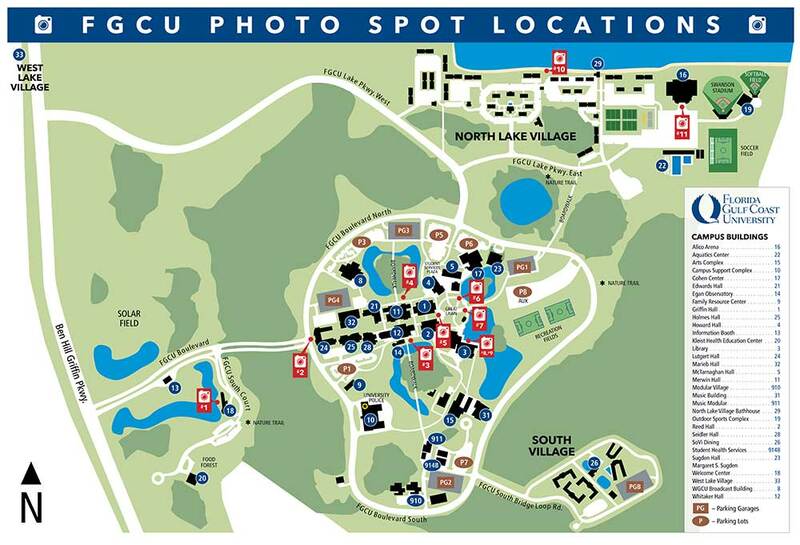 Read the story about the FGCU Photo Spots. You must meet all 5 requirements and post your entry between 8 a.m. EST Tuesday, Nov. 14th and 5 p.m. EST Monday, Nov. 20th, 2017 to qualify. No exceptions. All valid entries will be considered by our expert judges and narrowed down to 3 finalists. The finalists will be posted on the @FGCU Instagram for our followers to vote on their favorite between 2 p.m. EST Tuesday, Nov. 21 and 2 p.m. EST Wednesday, Nov. 22. “Likes” = votes, and the post with most likes wins! Three finalists will win a variety of FGCU swag bag plus $20 in Dining Dollars. The promotion begins and ends on the dates and times specified. We are offering prizes to individuals selected based on votes (likes) on the @fgcu Instagram. You must be an individual legal resident of the 50 United States or the District of Columbia and the older of 18 years of age or the legal age of majority in your state of residence. You MUST tag our Instagram account, @FGCU, in your photo and use the hashtag #FGCUat20 in your caption and must include Photo Spot sign in the photo (sign does not have to readable) to be considered a valid entry. Odds of winning depend on the number of eligible entries received. Limit one entry per person. FGCU Marketing & Communications employees and their immediate family members are not eligible to participate. Winners will be notified with a direct message by 12 p.m. EST Nov. 22, 2017. Once notified, winners will have until 5 p.m. EST Dec. 1, 2017 to claim prizes at FGCU Marketing & Communications (Modular 3). We reserve the right to modify or cancel this promotion at any time. This promotion is in no way sponsored, endorsed or administered by or associated with, Instagram.